You Inspire The Best in Us. With the many advances in cancer treatment, today’s cancer patients have more and more reasons for hope. Portraits of Hope are the incredible stories of our patients and their journeys of hope and survival. Click on a thumbnail and scroll down to view each story. Manning resident Ethel Starks, a wife, mother of three and grandmother of five, has been active all her life. As a 19-year breast cancer survivor, Ethel knows the importance of taking good care of herself and keeping an eye on her health. 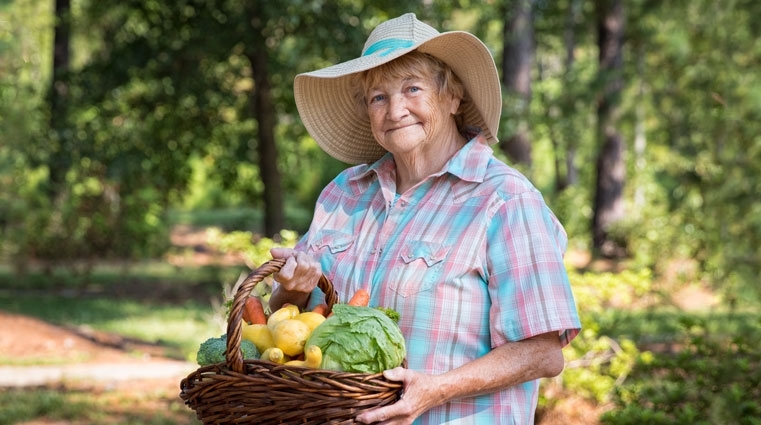 But in the summer of 2015, Ethel noticed she felt more fatigued and short of breath with only small amounts of activity. There were other signs as well – weight gain and a cough that would not go away. She initially blamed the symptoms on soaring summer temperatures, but she knew that there may be more to her worries. At her next appointment with her primary care physician, Ethel shared her concerns. “With my heart history and my current symptoms, she admitted me to the hospital that same day. That is when I first met McLeod Cardiologist Dr. Ryan Garbalosa with McLeod Cardiology Associates Sumter. After learning about my symptoms, Dr. Garbalosa started ordering tests to check my heart,” said Ethel. One of the tests ordered by Dr. Garbalosa was an echocardiogram. An echocardiogram uses sound waves to allow physicians to see how the heart moves and pumps blood. This test can show how the heart functions and can detect fluid around the heart. When the test is complete, an “ejection fraction” or “EF” is calculated which is an estimate of how the heart is functioning. “Normally, this is somewhere around 50 to 70 percent,” explained Dr. Garbalosa. “For Ethel, it was only 13 percent, showing that her heart was very weak. A low ejection fraction, one of the causes of congestive heart failure, occurs when your heart is not working well enough to keep your blood circulating correctly. This was the cause of Ethel’s symptoms. “A decrease in ejection fraction can be caused by several things,” said Dr. Garbalosa. “The most common causes are not getting enough blood flow to the heart due to a blocked blood vessel or having an uncontrolled blood pressure. However, there are many other reasons such as infections, certain medications, or problems with the electrical signals in the heart. “Ethel already had some heart problems from a previous heart attack, but it seemed that her symptoms were getting much worse. It got to the point where she could not lay down to sleep or walk across the room without difficulty breathing. It was tough going at first because her symptoms were severe and her heart was so weak, but I told her that I would not give up on her,” added Dr. Garbalosa. “I was worried about my health, but even more so about my family,” Ethel stated. “What if my heart stopped while I was sleeping? What about my husband, my children, and my grandchildren? What if I missed my grandchildren growing up?” These worries became her reasons to fight. One of the reasons that Ethel’s symptoms were so significant was that the electrical signals in the heart were not working properly. Dr. Garbalosa performed an ECG, or electrocardiogram, which indicates the electrical activity of the heart. “It was abnormal and showed that both sides of her heart were not squeezing at the same time. At this point I referred Ethel to McLeod Electrophysiologist Dr. Rajesh Malik,” said Dr. Garbalosa. Dr. Malik implanted a special kind of pacemaker called a bi-ventricular pacemaker/defibrillator that would pace both sides of Ethel’s heart so they squeezed in unison as well as to prevent her from having an abnormal heart rhythm. After the procedure, Ethel spent the next few days at McLeod Regional Medical Center surrounded by staff that she says joined her in her fight. For the next year, Ethel was followed closely by Dr. Garbalosa. At first, she saw him every few weeks, then every few months. 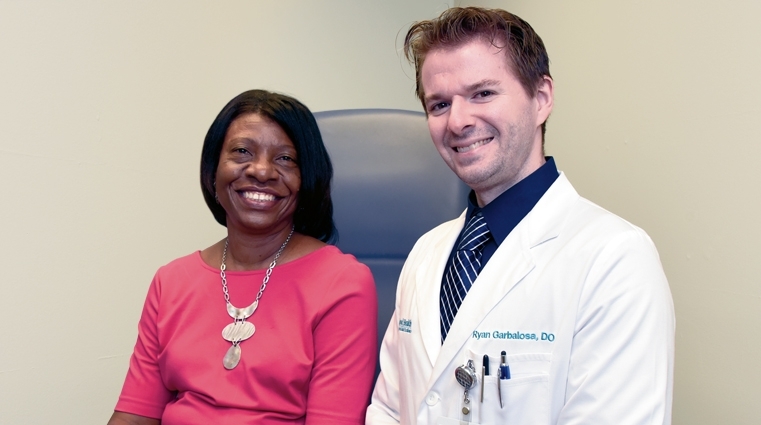 Each time, Dr. Garbalosa adjusted her medications and made sure she was avoiding salt. Slowly Ethel started walking more and continued increasing her activities. “I felt like I had been given a second chance,” said Ethel. 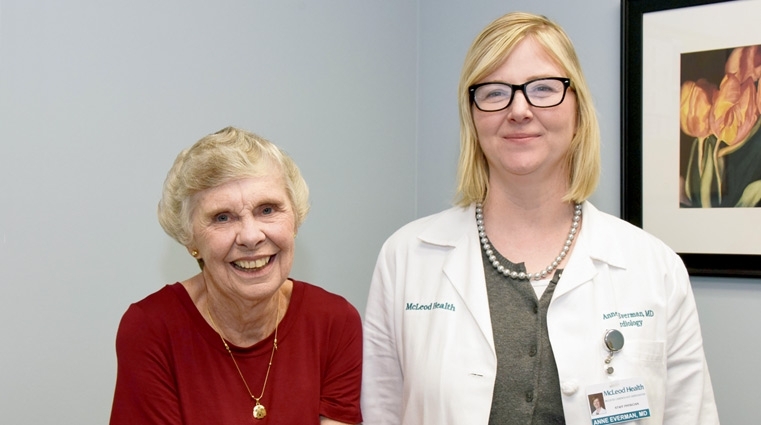 Today, more than three years after Dr. Garbalosa began assisting Ethel in taking control of her heart health, she remains grateful to him and the McLeod team for helping her regain her quality of life. She says that she is able to do some activities now that she hasn’t done in years, even the small things that many take for granted. “I can enjoy a family vacation and keep up with my five grandchildren. I’ve also returned to work and I’m able to do more around the house,” Ethel added. “My faith in God, my family, and Dr. Garbalosa are why I’m doing so well. A few months after settling into their new home, Jerry walked into the kitchen where Jeri was sitting at the table and he began mumbling, saying he didn’t feel “right.” Knowing something was wrong and fearing a stroke, Jeri made the decision to take her husband to the McLeod Health Seacoast Emergency Department (ED). Upon evaluation, the Burkharts were told Jerry had experienced a transient ischemic attack (TIA), also referred to as a mini-stroke. A temporary blockage in the brain, the symptoms of a TIA are similar to a stroke, but are not permanent. However, a TIA is a warning sign of a stroke, so immediate evaluation of the cause is needed. The ED Physicians made the decision to transport Jerry to McLeod Regional Medical Center in Florence for further evaluation and treatment. Because of his strong risk factor profile for heart disease due to diabetes, high blood pressure, high cholesterol, and other known arterial disease, Jerry understood the importance of being monitored by a vascular surgeon and cardiologist. After his hospitalization in Florence, Jerry scheduled appointments with McLeod Health Vascular Surgeon Dr. Christopher Cunningham and McLeod Health Cardiologist Dr. Gavin Leask. Dr. Cunningham is a member of the McLeod Vascular Associates team. Dr. Leask treats patients at McLeod Cardiology Associates. To assess Jerry’s heart function and risk of obstructive coronary artery disease, Dr. Leask ordered an echocardiogram and nuclear stress test. Both tests returned with normal readings. Prior to his first visit with Dr. Cunningham, Jerry began to experience slurred speech. Based on this new symptom, Jerry’s appointment with Dr. Cunningham was sooner. A computed tomography angiography (CTA) scan, a special kind of CT exam that focuses particularly on the blood vessels, was performed. Dr. Cunningham examined Jerry and reviewed the results of his CTA scan. He explained to Jerry that the slurred speech occurred because his left carotid artery (located in the neck) showed a tight stenosis, a narrowing in a blood vessel. Dr. Cunningham scheduled Jerry for a carotid endarterectomy, a surgical procedure to reduce his risk of a future stroke. During an endarterectomy, plaque is removed from inside the artery correcting the stenosis. Jerry’s surgery went well and he returned home within 24 hours. At his follow-up appointment with Dr. Cunningham, Jerry mentioned that he struggled walking for any distance. He shared that he could not even walk the length of a football field. This difficulty interfered with Jerry’s ability to exercise. He explained to Dr. Cunningham that the symptoms had progressed over the past several years. A second CTA scan was administered which detected an arterial occlusion, or blockage. Dr. Cunningham scheduled Jerry for an angioplasty, a surgical procedure that removes plaque in an artery. A couple of hours after surgery, Dr. Cunningham discharged Jerry home after he observed him walking normally. Stroke patients remain under life-long care by a physician. Dr. Cunningham and Jerry have created a friendship and bond through all of Jerry’s procedures. Today, Jerry and his wife are appreciating retirement and living a healthier life. He is also back in the gym enjoying what he loves. 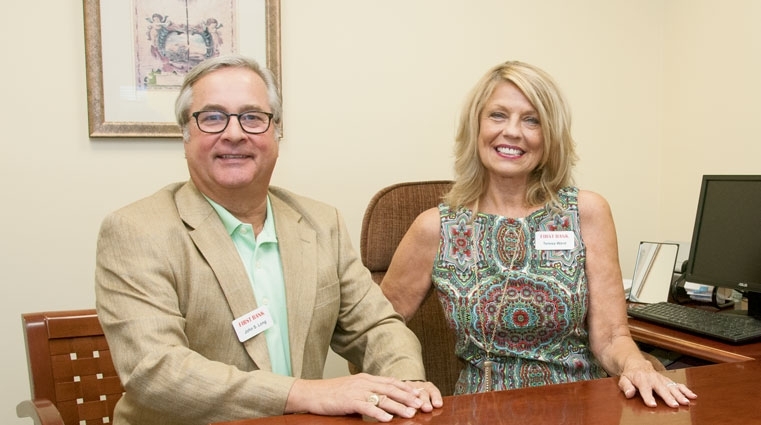 Through his many travels, Jerry chose to make North Myrtle Beach his home and says he is blessed to have McLeod Health right around the corner. “I highly recommend McLeod Health,” added Jerry, whose excellent outcomes have brought quality to his life and retirement. To look at Bob Sillman, one would have thought he was the picture of good health. Energetic and active at 60 years of age, Bob and his wife Charlotte start most mornings with a brisk walk before breakfast and getting ready for work. However, the morning of August 7, 2018 did not proceed according to their normal schedule. Prior to their walk, Bob began his morning ritual of brushing his teeth and shaving before walking. As he was getting ready, he noticed something odd about his right hand. When he reached to flush the toilet, he missed the handle twice. Finally, he succeeded on his third try. A 15-year member of the McLeod Health team, Bob’s mind leapt to a message he had seen often on flyers and billboards. F.A.S.T. (Face, Arm, Speech, Time), the acronym for recognizing signs of a stroke, explained the symptoms he was experiencing. 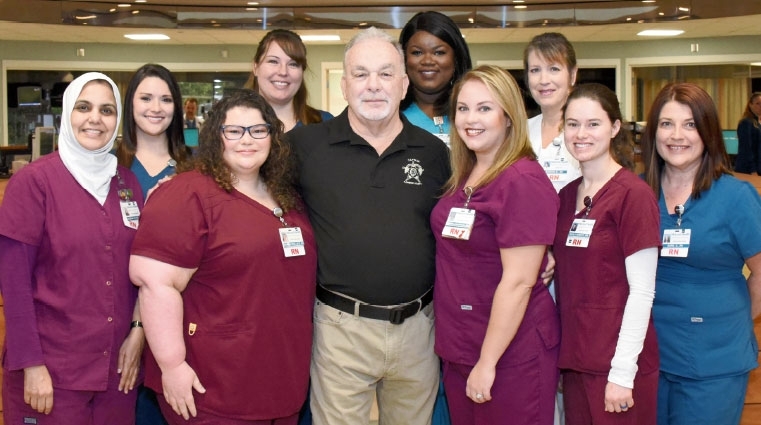 Bob’s wife Charlotte, an occupational therapist at McLeod Health Darlington, said, “As soon as I saw his face, I knew he was having a stroke.” Knowing that time was crucial, they rushed to the McLeod Regional Medical Center Emergency Department for treatment. An examination by the emergency medicine team revealed that Bob had high blood pressure and high cholesterol, but more alarming was the discovery of an elevated blood sugar level of 302. That number triggered Bob having a test called an A1C, a measurement of the blood glucose levels in hemoglobin used to diagnose diabetes. Normal ranges for non-diabetics are below 5.7 percent. Bob’s level was 12.9 percent, making him a diabetic. “In a matter of hours, I went from thinking I was healthy to having a stroke and being a diabetic,” said Bob. “I was not aware of any family history of diabetes, and I felt fine. I knew my life was changed forever, and that these concerns, in all probability, had been fully preventable.” In addition, Bob’s work-up showed a 99 percent blockage of his right carotid artery (the artery supplying blood to the right side of his brain). This blockage also had small particles of blood clot in it, significantly increasing Bob’s risk for yet another stroke. Because of this, McLeod Vascular Surgeon Dr. Carmen Piccolo was consulted. “Given the amount, location and type of blockage in his carotid artery, Bob needed the more traditional open endarterectomy. During this procedure, we make a cut in the neck, open the artery, clean out all of the blockage and then place a patch on the artery to make it bigger,” explained Dr. Piccolo. The carotid surgery was performed on August 10 -- only three days following Bob’s stroke. While preparing for his surgery, Bob was visited by McLeod Neurologist Dr. Timothy Hagen. Dr. Hagen confirmed the initial stroke diagnosis and was monitoring Bob’s care as his stroke symptoms subsided. They had a conversation Bob will never forget. That moment sparked more reflection: how had he gotten here? What could he have done to prevent it, and what should he do going forward? 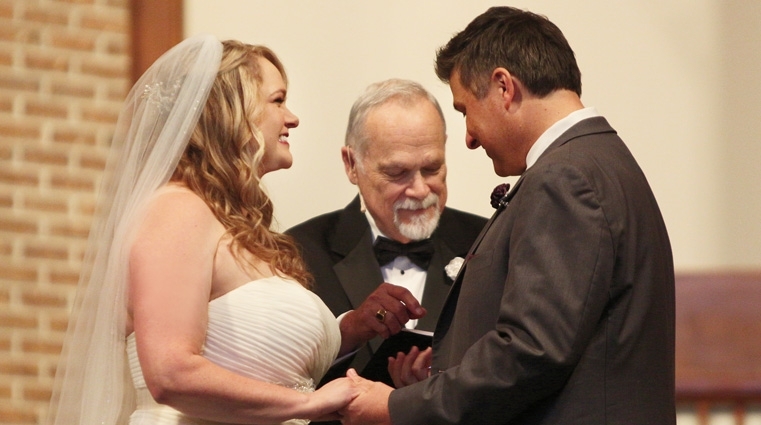 Bob had not seen a doctor for an annual check-up or even brief illness for more than a decade. He had no established relationship with a family medicine or internal medicine physician, and had not taken advantage of free occupational health programs provided by his employer. Unfortunately, working in healthcare and having access to physician practices did not lead to his seeking a primary care provider. At a post-surgical appointment with Dr. Piccolo, Bob discussed his questions and lack of a personal physician. At Dr. Piccolo’s urging, Bob set up an appointment with McLeod Family Medicine Physician Dr. Stephanie Strickland. Under Dr. Strickland’s care, Bob now has a physician dedicated to addressing his concerns directly, especially his new challenge of diabetes. “Dr. Strickland works with me on medications, diet and lifestyle changes,” said Bob. “Before my stroke, I rarely ate fruit and vegetables, mostly just starches like pasta and meats. Little did I know that the carbohydrates and hidden sugar in my diet put me on the path to diabetes. If he ever needs motivation to continue those changes, Bob only has to look in the mirror. The scar on his neck is a permanent reminder of the close call that gave him a second chance. One cold, crisp morning, Dwight Lindley stepped outside and breathed in the fresh air. He noticed that his lungs felt a little sensitive from the bitter temperature. Dwight considered the achy feeling in his lungs that he experienced whenever going out into the cold air as normal. However, when the season changed, and the temperatures rose, the achy feeling did not go away. A family history of heart disease and being diabetic prompted a referral by Dwight’s primary care physician to Interventional Cardiologist Dr. Fred Krainin of McLeod Cardiology Associates. Diagnostic testing, including a heart catheterization performed by Dr. Krainin, revealed five coronary artery blockages, all more than 90 percent blocked. Due to the seriousness of his condition, Dr. Krainin did not release Dwight to go home following his catheterization. Dwight needed immediate open heart surgery to repair the blockages. Dr. Krainin referred Dwight to Dr. Robert Messier, a Board Certified Cardiothoracic Surgeon whose areas of expertise include Coronary Artery Bypass Grafting Surgery, Minimally Invasive Heart Valve Repair, and Thoracic Aneurysm Surgery. Dr. Messier, along with his partners, Dr. Wayne Holley, Dr. Cary Huber and Dr. Scot Schultz, bring world class heart care to patients in Northeastern South Carolina and Southeastern North Carolina. On March 13, 2018, Dr. Messier performed Dwight’s quadruple Coronary Artery Bypass surgery. Dwight had four blockages that could be bypassed. The fifth blocked artery was too small to bypass, but it would not affect the performance of his heart, according to Dr. Messier. “As I lay on the surgical table in the operating room, I had an expectation I would be asked to count backwards,” said Dwight. “I thought the anesthesiologist would ask me to do this to help put me to sleep for the surgery, but the counting never took place. “One minute I was involved in a conversation with Dr. Messier and the next thing I knew I was waking up in recovery. I believe Dr. Messier helps relieve last minute anxiety for his patients by engaging them in conversation like he did with me. “After surgery, I experienced very little pain except when I had to cough,” added Dwight. Patients who have undergone surgery require breathing exercises, using an incentive spirometer given to them while they are in the hospital, as well as deep breathing and coughing every couple of hours to ensure their lungs stay fully inflated. These exercises can be painful for open heart surgery patients because of their large chest incision. For this reason, they are given a heart hugger pillow to hold against their chest whenever they cough or move. 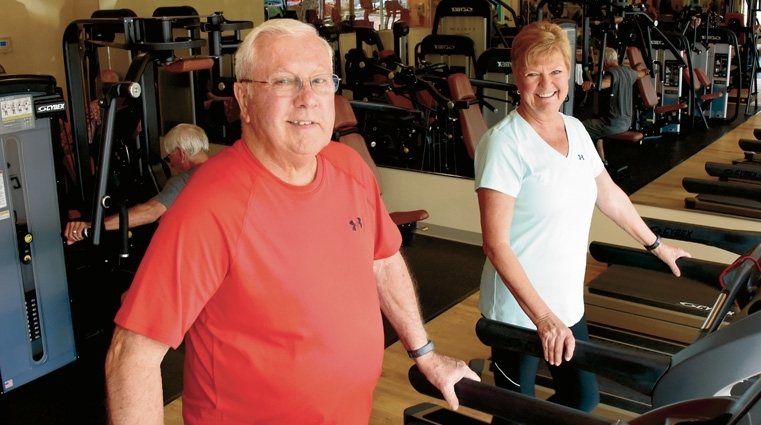 Once Dwight sufficiently recovered from surgery, he began Cardiac Rehabilitation at the McLeod Health and Fitness Center. He admits exercise, a nonexistent entity in his life prior to surgery, has now become more of a focus. Dwight exercises three times a week at the McLeod Health and Fitness Center and uses a stationary bike at home. Today, Dwight is grateful he made the decision to see his primary care physician in March. “I had no idea my diagnosis would end up being heart-related,” said Dwight. “I encourage anyone feeling something they find troublesome to not take it too lightly. It could be more than you expect. Fortunately, I didn’t let it go or it may not have been such a positive outcome for me. “During my heart journey, I felt like I had my own personal team handling my care – from Dr. Krainin and Dr. Messier to the McLeod Home Health team, who provided post-surgery home care, and McLeod Cardiac Rehabilitation. They all worked so well together. I am now ready for my next 70 years,” added Dwight. 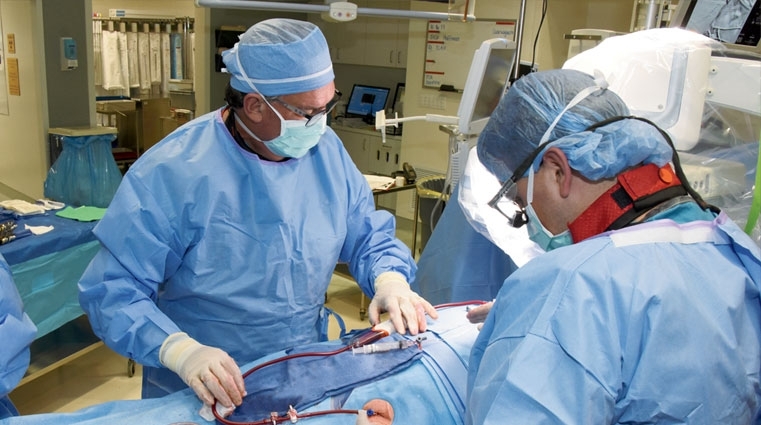 New Convergent Procedure Combines Cardiothoracic Surgery and Electrophysiology to Treat A-Fib. An irregularity of the heartbeat, atrial fibrillation, occurs in ten to 15 percent of the population -- increasing in prevalence as a person ages. The irregular heartbeat weakens the heart muscle with time. More importantly, it increases an individual’s risk of stroke. As the blood collects in the upper chambers of the heart it tends to form clots, which can cause strokes. “The most common arrhythmia in adults, atrial fibrillation (A-Fib) increases with age, from less than one percent of those younger than age 60, to roughly one in every ten persons aged 80 years or older,” explained Dr. Rajesh Malik, a McLeod Electrophysiologist. An Electrophysiologist specializes in evaluating the abnormalities of the heart’s rhythm. Dr. Malik serves as one of two physicians at McLeod who treats the electrical system of the heart. A significant portion of the people on a medical regime for A-Fib are intolerant to the medication for one reason or another. Blood thinners, a core component in the treatment for atrial fibrillation, can also cause bleeding complications and other issues in many patients. If the medicines or blood thinners do not work, usually the next treatment step involves an ablation performed by an Electrophysiologist. Ablation refers to removing or disconnecting some of the abnormal electrical connections that contribute to atrial fibrillation. Ablation potentially may permanently cure an arrhythmia, and many times, allows the patient to avoid taking medication. If successful, an ablation eliminates the atrial fibrillation problem for a significant number of patients. An operation performed by a Cardiothoracic Surgeon can also cure atrial fibrillation, but it is fairly invasive and requires making a large incision in the chest and putting the patient on the heart lung bypass machine. 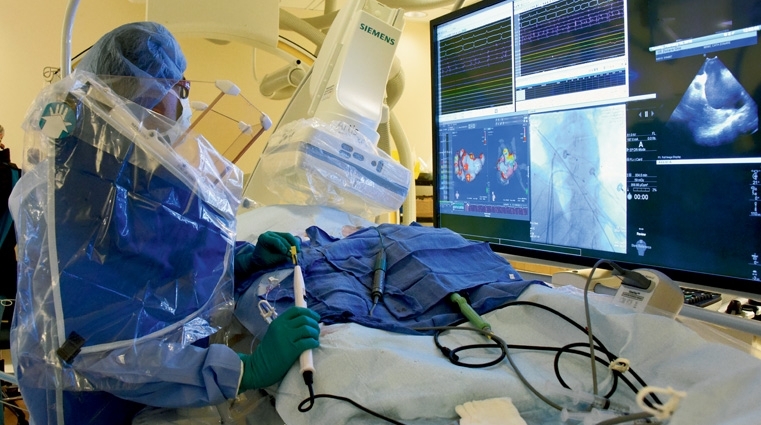 For patients with atrial fibrillation who are sensitive to medications and blood thinner treatments, or their ablation procedure was unsuccessful, they may be considered a potential candidate for Convergent, a new procedure available at McLeod Regional Medical Center that combines the best aspects of the surgical approach to atrial fibrillation with the Electrophysiologist’s ablation technique. During the Convergent procedure, the Cardiothoracic Surgeon performs a minimally invasive approach to ablate, (destroy), the tissues on the back of the heart. An Electrophysiologist then performs ablations on the inside and front portions of the heart. “By combining these two techniques, we produce a much more reliable result for the patient and a potential way for them to no longer need their medications and/or blood thinners,” said Dr. S. Cary Huber, McLeod Cardiothoracic Surgeon. The surgical portion of the procedure, performed by Dr. Huber, involves a small one to two-inch incision right below the breastbone. Dr. Huber inserts the ablation device directly into the small incision. With the assistance of a small camera, a radiofrequency current of targeted heat destroys the tissue in the problem areas of the heart to restore it back to a regular rhythm. Dr. Malik then threads a thin, flexible wire catheter through the inside of the heart for his portion of the procedure. Using radiofrequency ablation, Dr. Malik ablates any remaining gaps and conducts tests to confirm that all of the abnormal electrical impulses have been eliminated. The procedure requires three to four hours. Most patients recover in the hospital for two or three days afterwards and return to normal activities within a couple of days after going home. This minimally invasive procedure offers a much faster recovery than with an open procedure. “The Convergent procedure is one opportunity we have available to help patients manage their atrial fibrillation,” said Dr. Malik. “At McLeod, we have embraced the heart team concept, not just for arrhythmia surgery, but for all types of heart problems whether it involves coronary artery valve issues or arrhythmia,” added Dr. Huber. Ann Keelan, a retired medical professional, suffered from mitral valve prolapse and understood the risks involved with her condition. After moving to Surfside Beach from Maryland, she began to research hospitals in the area and was impressed by the quality and expertise of the McLeod Health physicians and staff. The heart has four valves that are essentially flaps of tissue, whose job is to keep the blood flowing in one direction through the heart and body. If any of the four valves does not open or close properly, the result is heart valve disease. One of the most common heart diseases in females, mitral valve prolapse, occurs when the valve leaflets do not seal properly. Untreated leaky mitral valves can lead to chest pain, palpitations, shortness of breath, exercise intolerance, infections, dizziness, fainting, panic attacks and stroke. After Ann established a relationship with a primary care physician, she was advised to schedule an appointment with a cardiologist to monitor her mitral valve condition. Understanding the risks involved with mitral valve prolapse, her physician wanted to ensure Ann was observed more closely. He then referred Ann to Dr. Anne Everman with McLeod Cardiology Associates. Dr. Everman discussed monitoring Ann’s condition in order to be proactive with necessary treatments. “When I first met Ann, we found she was at a moderate state in her mitral valve prolapse condition,” said Dr. Everman. “Our goal was to get in front of the problem -- monitoring her condition closely. “Given that initial symptoms are subtle, patients frequently pass off their symptoms as an excuse of getting older and slowing down,” said Dr. Everman. In May of 2017, diagnostic testing using echocardiography indicated to Dr. Everman that Ann may be in need of valve surgery. Her mitral valve had deteriorated and wasn’t closing properly, allowing blood to flow backward into her left atrium and lungs. Dr. Everman recommended Ann see Dr. Scot Schultz, a McLeod Cardiothoracic Surgeon, to discuss options for repairing the leaking valve. Dr. Schultz has experience and specializes in all types of valve repair and replacement. Mitral valve repair is unique for every patient. Successful repair requires the experience of a cardiothoracic surgeon who has an understanding of how the heart’s valve and muscle structure function as one. For this reason, mitral valve repair requires the attention of the most competent heart and valve surgeons available. After examining Ann, Dr. Schultz scheduled her for surgery at McLeod Regional Medical Center in Florence the following week. During Ann’s surgery, Dr. Schultz and his anesthesia colleagues determined a valve replacement was not necessary and felt confident a complex repair would provide a durable solution to her leaky mitral valve. When possible, valve repair is preferable to replacement as this carries a lower risk of complications. During her recovery in the hospital, Ann developed atrial fibrillation (A-Fib), a common occurrence following heart surgery. This condition is a quivering or irregular heartbeat (arrhythmia) of the atria (top chambers of the heart) that can lead to blood clots, stroke, heart failure and other heart-related complications, if left untreated. Electrophysiologist Dr. Rajesh Malik with McLeod Cardiology Associates, a specialist in this condition, reviewed Ann’s case to determine how to alleviate her risk of A-Fib. Since Ann’s A-Fib prevented a regular heart rhythm, Dr. Malik explained that an implantable pacemaker, along with medication, would assist in regulating the timing and sequence of her heartbeat. Prior to being released from the hospital, Dr. Malik performed Ann’s pacemaker procedure. “During my career in the medical field, I worked alongside many great medical professionals,” said Ann. “McLeod Health set the bar higher than any other medical institution I’ve seen. If you were fortunate to have participated as one of the 7,000 children who attended the Florence County Sheriff’s Department’s Camp Pee Dee Pride over the past 20 years, then you had the pleasure of interacting with Captain Wayne Howard. A 44-year veteran of the Sheriff’s Department, Captain Howard has spent 22 years of his career working with the community to help make the camp a reality for children. Fundraising activities are vital to the existence of Camp Pee Dee Pride. In March of 2017, the camp was just weeks away from a major fundraising event when the program’s dedicated leader became ill.
Captain Howard was working in his yard that Sunday afternoon in March. He suddenly began to feel hot, sweaty, and nauseous. His wife, Karen, called an ambulance to transport him to the McLeod Regional Medical Center Emergency Department. Captain Howard was admitted to the McLeod Heart and Vascular Intensive Care Unit. Shortly after arriving in the unit, his heart rate dropped to zero and his heart stopped beating. The nurses responded quickly to begin chest compressions, but Captain Howard’s heart started beating again on its own. The Cardiac Catheterization team, along with McLeod Interventional Cardiologist Dr. Alan Blaker, were immediately alerted. Captain Howard’s heart rate was still dangerously low, which could have led into cardiac arrest at any moment. The nurses externally paced his heart through the use of an external pacemaker to bring his heart rate up until the Catheterization Team and Dr. Blaker could arrive. “Captain Howard had come into the ED with dangerously high potassium levels, which is what caused his heart to stop,” said Dr. Blaker. “Coupled with a very low heart rhythm, we needed to put in a temporary pacemaker. The temporary pacemaker served to protect his heart until such time as McLeod Electrophysiologist Dr. Rajesh Malik could implant a permanent pacemaker. Dr. Malik is a partner with Dr. Blaker along with eighteen other cardiologists that provide cardiac care to patients in the McLeod Cardiology Associates offices located in Florence, Sumter, Loris, Little River and Myrtle Beach. During the procedure, Dr. Blaker also searched for coronary blockages. He located several blockages at the front of Captain Howard’s heart and was able to repair one on the back of his heart with a drug-eluting stent, according to Dr. Blaker. It was five days from his Emergency Department arrival before Captain Howard could remember any of these traumatic events. His first concern upon waking was his wife. The ICU nurses told him he never asked about himself, his questions were always inquiring about Karen. He wanted to make sure she was okay. His second concern was Camp Pee Dee Pride -- making sure that everything stayed on track for a summer full of fun for the children. 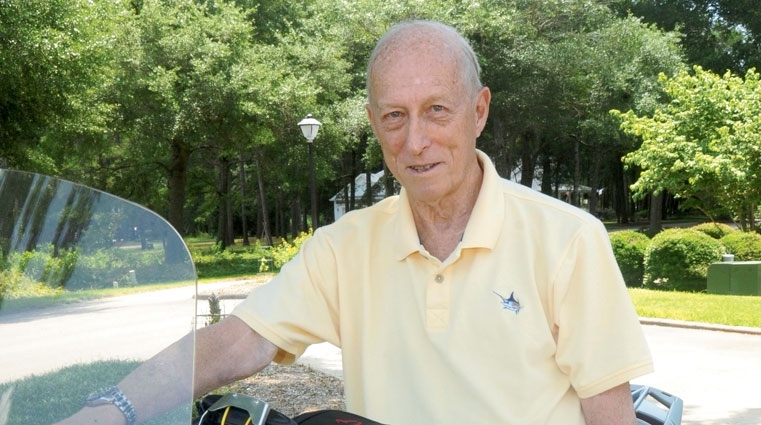 From his bedside, Captain Howard reached out to his assistant, Investigator James Allen, with the Florence County Sheriff ’s Department to ensure that the golf tournament taking place in three weeks was all set. “I have been a member of the McLeod Health and Fitness Center for 15 years, exercising four times a week, so my physicians were not concerned with my overall physical fitness,” explained Captain Howard. “They allowed me to delay my participation in Cardiac Rehabilitation until after Camp Pee Dee Pride as long as I didn’t overextend myself, and I began a heart healthy diet. Fortunately, with the help of James and my support staff, it was another successful summer. “This episode with my heart was very surprising. Since the 2017 camp season has ended I have been participating in McLeod Cardiac Rehabilitation and working closely with my physicians to make sure I stay healthy. I am so appreciative of everything the McLeod doctors and nurses did to save my life. I can truly say I am here today because of the care I received at McLeod,” added Captain Howard. Transcarotid Arterial Revascularization Procedure Now Available. Stroke, a leading cause of serious, long-term disability in the United States ranks as the fifth leading cause of death in South Carolina. In an effort to decrease the risk of stroke for patients who may not be a candidate for other stroke treatments, McLeod offers a new minimally invasive procedure to treat carotid artery disease. The carotid arteries, the main arteries to the brain, carry blood flow on each side of the neck up into the brain. Their function is to provide oxygen. Over time, people develop problems with the arteries to their brain in the form of blockages as plaque builds up in the walls of their carotid arteries. This plaque consists of cholesterol, calcium and fibrous tissue. As the plaque increases, the arteries narrow and eventually the build up of plaque reduces the blood flow through the arteries. If those blockages get severe enough they can cause a stroke. Ischemic strokes account for 80 to 90 percent of strokes with an estimated 20 to 30 percent caused by disease in the carotid arteries. Carotid artery disease is a serious issue because blood clots can form on the plaque, and if a clot or a piece of plaque breaks loose and travels to the brain it can block the blood flow to the brain. Carotid endarterectomy, a procedure to treat carotid artery disease, is performed by the Vascular Surgeons of McLeod Vascular Associates. During this procedure, the McLeod Vascular Surgeon exposes the carotid artery through an incision on the side of the neck. The artery, after being clamped on both sides of the blockage, is then opened to access the plaque. The plaque is removed from inside the artery and the artery then sewn back together. For these patients, a new procedure called Transcarotid Arterial Revascularization (TCAR) is now available. During the procedure, a McLeod Vascular Surgeon (Dr. Christopher Cunningham, Dr. Carmen Piccolo, Dr. Eva Rzucidlo, Dr. Joshua Sibille or Dr. Gabor Winkler) makes a very small, one-inch incision by the collarbone to gain access to the blocked artery while the patient is under local anesthesia. To divert any dangerous debris that may break loose during the procedure, the blood flow in the carotid artery is temporarily reversed. A soft, flexible tube, placed directly into the carotid artery, connects to a filter system that directs the blood flow away from the brain and captures fragments of plaque that may come loose during the procedure. The blood is filtered and returned through a second tube placed in the patient’s thigh. This filter system also allows stenting to be performed to clear the blockage in the carotid during the blood flow reversal process. A stent, a tiny mesh wire tube, implanted inside the carotid artery, stabilizes the blocked area. The stent stays in the artery permanently to hold the artery open. After securing the stent, the filter system is removed and blood flow to the brain resumes its normal direction. After the TCAR technology underwent testing and clinical trials, the results were so powerful that the FDA approved and released it to programs like the McLeod Heart and Vascular Institute, who have an established Carotid Stenting Program and serve as members of the Vascular Quality Initiative for South Carolina. Being part of a quality initiative means McLeod compares the results of all of its vascular cases with its peers both regionally and nationally. When the unexpected happens, you need a strong team behind you. No one knows that more than Charlie Nelson, a retired teacher and tennis coach in Florence. What started as a feeling of pressure and back pain, quickly became a matter of life or death. Coach Nelson went to the nearest emergency department where tests revealed a tear in his aorta, resulting in critical blood supplies being cut off from major organs. The McLeod HeartReach ambulance quickly transported him to McLeod Regional Medical Center in Florence, where Dr. Christopher Cunningham, a top McLeod Vascular Surgeon, went to work. Using x-ray imaging, Dr. Cunningham skillfully guided a catheter through the artery and sealed the tear with a stent graft. Thankfully, when Coach Nelson was in the match of his life, our vascular expertise served up the healthcare ace he needed. Pasty knew something was wrong when she couldn’t catch her breath and walk the forty yards to her beloved garden. Shortly after, Patsy experienced a heavy chest and was rushed to McLeod Loris where doctors determined she had suffered a heart attack. 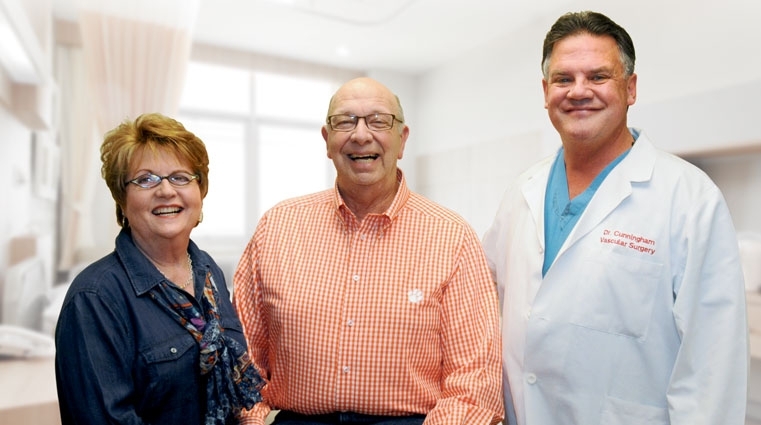 Patsy’s condition required critical attention and the skilled team at McLeod Loris quickly transferred her to McLeod Regional Medical Center, where renowned McLeod Cardiothoracic Surgeon Dr. Scot Schultz told Patsy she required a quadruple bypass. Utilizing the latest techniques and leading edge technology, Dr. Schultz and his team skillfully performed the complex bypass and had Patsy up walking the very next day. “To all of my physicians and nurses at McLeod, I’ve never had such wonderful care from any other hospital. Thank you for giving me a second chance at life,” said Patsy. Today, the only thing taking Patsy’s breath away is her beautiful garden. The average person is often unable to tell when their heart goes into atrial fibrillation. In Mike Cullipher’s case, he said he always knew when those 15 to 30 second rapid heart beating episodes occurred. The Mullins resident began seeing McLeod Interventional Cardiologist Dr. Anil Om for the treatment of atrial fibrillation in 2001. Atrial fibrillation, also called AF or A-Fib, is one of the most common irregular heart rhythms. An abnormality of the electrical system of the heart, A-Fib is a rapid beating of the upper chambers of the heart, which prevents the heart from pumping blood adequately to the lower chambers. People who suffer from atrial fibrillation may experience heart palpitations, irregular heartbeat, shortness of breath, dizziness, faintness, and mild to severe chest pains. “Many patients also experience feelings of weakness or fatigue, caused by the heart’s diminished pumping ability,” explained Dr. Rajesh Malik, a McLeod Electrophysiologist. Over the next fifteen years, Mike’s condition was managed through medication and eventually an ablation, a procedure to correct heart rhythm problems. Performed in the same manner as a heart catheterization, an ablation delivers heat, cold or radio energy through the groin to destroy the tissue that triggers the abnormal rhythms. The ablation worked for a short time but ultimately Mike’s atrial fibrillation returned. In 2015, he was referred by Dr. Om to Dr. Malik. A healthy heart beats between 60 and 90 times per minute. In A-Fib the upper chambers of the heart can fibrillate up to 500 times a minute. Because the heart is beating so fast and irregularly, the heart’s pumping action does not work properly when the pumping does not function correctly, the blood will not completely empty from the chambers making the blood more likely to pool and to clot. If a clot pumps out of the heart, it can travel to the brain, resulting in a stroke. “People who have atrial fibrillation are five times more likely to have a stroke than people who do not have this condition,” said Dr. Malik. Dr. Malik believed Mike’s best chance of recovery was the MAZE procedure. The MAZE procedure is a surgical intervention for heart patients whose atrial fibrillation cannot be controlled by medications or for those who are undergoing open-heart surgery for other reasons. MAZE cures A-Fib by interrupting the electrical patterns that are responsible for the irregular heartbeat. With the MAZE procedure, a McLeod Cardiothoracic Surgeon uses a radiofrequency probe to burn lesion areas in the heart tissue without damaging the heart. These lesions, placed in strategic areas of the upper chambers of the heart, generate scar tissue that redirect the electrical pattern so the heart can pump in a normal way. In December 2015, McLeod Cardiothoracic Surgeon Dr. S. Cary Huber performed the MAZE procedure on Mike. Because his case was so complex, Dr. Malik assisted Dr. Huber in the operating room. “With cases like Mike’s, after I have completed the MAZE ablation, Dr. Malik will perform inter-operative electrical mapping. During this procedure, Dr. Malik inserts a specially designed catheter into the heart to test the electrical activity where the irregular arrhythmia was occurring to ensure that the ablation was successful,” explained Dr. Huber. “Dr. Huber told me I could expect my heart to continue to have A-Fib episodes after the surgery while it was recovering,” said Mike. “One week after returning home I felt the moment my heart went back into a normal rhythm, and it has never gone back out since then. “I am amazed at how much this surgery has changed my quality of life. The atrial fibrillation kept me from enjoying my favorite past times like hunting and fishing. My wife and I are also big supporters of our four grandchildren at all of their sporting games. Unfortunately, I had to miss most of their games because my health would not allow it,” said Mike. Mike is also a member of the 2nd Chance Ministries gospel quartet. Prior to the MAZE procedure, he did not have the breath to sing and had to stop performing. Today, Mike is happy to report that he is back on the road again with the group. “I am very thankful to Dr. Om, Dr. Malik and Dr. Huber for being those instruments in God’s hands that not only changed my life but saved it,” said Mike. “Throughout the many office visits and bedside care in the hospital, I found a sincere compassion from them that I will never forget. “They had a strong determination to ‘help me get better’ even in light of a case that was as difficult as mine. And, they ALWAYS had words of encouragement. I am forever grateful to each one of them. I love them for caring about me. I cannot say enough about the great team at McLeod,” added Mike. For patients like Mike, the McLeod Heart and Vascular Institute provides the most comprehensive and sophisticated heart care for patients from the midlands to the coast. Dedicated to extraordinary cardiovascular care, McLeod is one of the top hospitals in the nation for cardiac and vascular care, according to the most recent hospital ratings by Healthgrades, the leading online resource for comprehensive information about physicians and hospitals. These top honors include the 2016 Cardiac Care Excellence Award, 2016 Coronary Intervention Excellence Award and Top 5% in the Nation for Cardiology Services. It was a Tuesday unlike any other for Randy Rouse, a native of Dillon, South Carolina. 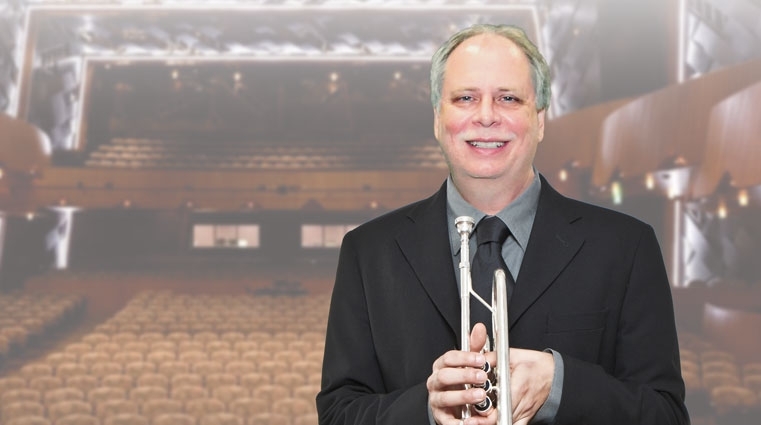 He describes February 23, 2016 as a “regular workday.” After leaving work, Randy attended rehearsal at the Performing Arts Center in Florence, South Carolina, where he plays the trumpet with the Francis Marion University Concert Band. He arrived at his home in Latta around nine in the evening. As he sat in the driveway, Randy was gathering his instrument and backpack, along with a few things from work. “I did not notice anything out of the ordinary until I got out of the car,” recalled Randy.“I was having trouble getting my items organized to bring into the house. I believe that was the beginning and first noticeable symptom of the stroke I experienced. Debra, who would have normally been upstairs at that time of night, was downstairs in the kitchen talking to their son. She noticed Randy was having trouble entering so she came to open the door. Randy recalled the interaction they had, “She spoke to me, but when I spoke back to her my speech was beginning to slur. Debra immediately called 911. Within a few minutes, a police officer came by to check on me and the ambulance arrived shortly. The calm of the emergency technicians in the ambulance, the speed of the receiving nurse at the McLeod Dillon ED door, the responsiveness of all the nurses and staff, and the processes that were followed mimicked “a symphony of care” for Randy that evening. All of the medical professionals involved in Randy’s care after that point credited his superlative, positive outcome to the treatment he received emergently in the McLeod Dillon ED. Randy is the Part Owner and Station Manager for HomeTown TV8 in addition to the Financial Administrator and Media Pastor for Dillon Church of God. Steve Johnson, Vice President of Operations and Advertising and also Part Owner of HomeTown TV8, was shocked when Randy was back at work on Monday -- only days later. Randy worked limited hours the following week as he continued to rest and regain his strength. Today, Randy is under the care of his primary care physician, Dr. Granville Vance at Dillon Family Medicine. Going forward, Randy is taking medication that will better control his high blood pressure, which was a contributing factor to his stroke. “I am blessed and highly favored,” added Randy. On May 10, 2016, Teresa Ward traveled to her job at First Bank in Cheraw, South Carolina, where she has been a customer service representative for 15 years. The work day progressed like any other day, with one difference -- Teresa began to notice that she was having shortness of breath and a general lack of energy. A nursing student at Northeastern Technical College, Brian continued to push Teresa to go to the hospital throughout the evening. She refused, believing she would begin to feel better. 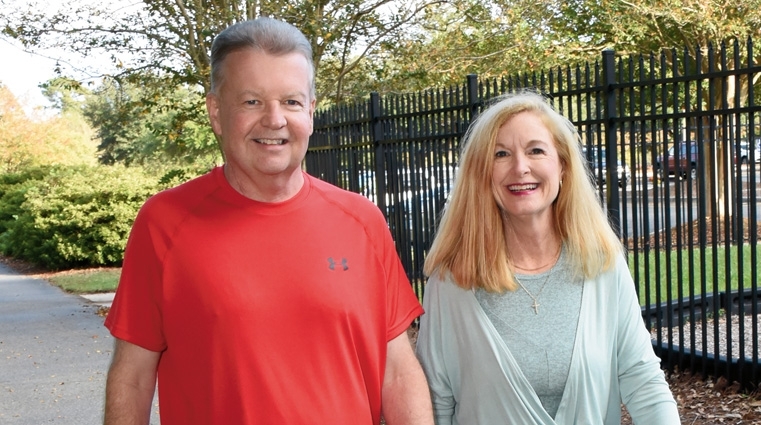 A few hours later when Brian heard Teresa panting for air and struggling to breathe, he made the decision to quickly transport her to the Emergency Department (ED) at McLeod Health Cheraw. On the way, Brian called the Emergency Department and communicated Teresa’s condition, medical history, current medications and how far away they were from the hospital. Upon arrival at McLeod Health Cheraw, the ED team was ready and waiting to begin treatment. Teresa was unresponsive and barely breathing when she arrived at the hospital. She had a faint pulse and within seconds was in respiratory and cardiac arrest. The ED team of Dr. Foy Connell, Mike Hutson, RN; Tonya Blackwell, RN; and Respiratory Therapist Sherman Manning, performed CPR and intubated Teresa so a ventilator could be placed to assist with her breathing. Minutes later, Teresa entered into pulseless Ventricular Tachycardia. The team had to shock her heart twice with a defibrillator to restore the heart’s rhythm. Once stabilized, Teresa was transported to the Intensive Care Unit for monitoring. The next day, Teresa was transferred to McLeod Regional Medical Center in Florence, South Carolina, for a heart catheterization procedure. After she arrived, physicians began to wean her from the sedation and ventilator. She slowly became conscious of her surroundings and began to breathe on her own. McLeod Interventional Cardiologist Dr. Brian Wall performed Teresa’s heart catheterization. During the procedure, Dr. Wall placed a stent in the left anterior descending artery of Teresa’s heart to open the blocked area. On May 14, Dr. Rajesh Malik, a McLeod Electrophysiologist, delivered the news to the family that the heart attack had severely damaged Teresa’s heart muscle. Her ejection fraction, the measurement of how well the heart pumps with each beat, was only 20 to 25 percent, where an average ejection fraction is 55 to 60 percent. Dr. Malik explained to Teresa that she would need to wear a LifeVest, which is a defibrillator worn by patients at risk for sudden cardiac arrest. The LifeVest provides protection by continuously monitoring the patient’s heart and, if a life-threatening heart rhythm is detected, the device delivers a treatment shock to restore normal heart rhythm. It also allows the patient’s physician time to assess their long-term arrhythmic risk and determine if an implantable defibrillator is needed. That evening, Teresa and her family and friends prayed for her healing. By the time she fell asleep that night, she was at peace, comforted by her faith and ready to face the outcomes ahead. The next morning, Teresa had a second echocardiogram performed in preparation for the LifeVest. During the test, Teresa noticed that the technician appeared surprised by what she was seeing. When Teresa asked what caused her concern, the technician said that something looked very different from the last one she performed, and that Dr. Malik would need to speak with her about it. On June 7, Teresa had a follow-up appointment with her primary care physician, Dr. Alex Newsom at Cheraw Family Medicine. After a thorough examination, Dr. Newsom gave her a good report and emphasized the importance of properly taking her medication. He also prescribed cardiac rehabilitation for monitored exercise to strengthen her heart, and reminded her to seek immediate medical care if she experienced any warning signs of a heart attack. Teresa has been maintaining her good health and following her doctor’s orders. She exercises three times a week at McLeod Cardiac Rehabilitation and in early August, she was able to return to work at the bank. Dr. Simpson explained that the Cheraw Emergency Department has upgraded to the latest GE cardiac monitoring, “enabling us to provide better care for critically ill patients. We also have plans in place to expand our ED, building a larger state-of-the-art facility to better serve our patients in times of crisis. “I am grateful for the dedication of our ED physicians, nurses and staff to our patients. I know how hard they work and witness firsthand their willingness to learn even more to become providers of excellent emergency care. When the people of Chesterfield and Marlboro Counties, like Teresa, need emergency care our goal is t o provide the best care possible,” added Dr. Simpson. “We are truly blessed as a community to have the excellence of McLeod Health right here in our own neighborhood,” said Teresa. Today, she encourages people to know their family history, listen to their doctor and take their prescribed medication consistently. A fast car and motorcycle enthusiast, Paul Winter loves life. For years, he’s had the opportunity to teach others the skills of racing. These days, he especially enjoys the great outdoors, including big game fishing. A diagnosis of polycystic kidney disease ultimately affected Paul’s joy of racing. This condition occurs when clusters of noncancerous cysts develop within the kidneys. Diagnosed in 2000, Paul’s kidneys slowly deteriorated over the next ten years resulting in his need for dialysis. Patients require dialysis when the kidneys cannot filter blood, remove waste, toxins and excess fluid. Dialysis is a process using a hemodialyzer (artificial kidney) that mimics the function of a normal kidney. An Arterial Venous Fistula, a surgical joining of an artery and vein allowing blood flow from the artery to the vein, was placed in Paul’s arm to provide safe access for dialysis to be administered. Having dialysis three times a week, Paul needed sufficient arterial access to accommodate the dialysis’ large gauge needles. A fistula offers the least amount of infection risk and lasts longer than other dialysis-related procedures. 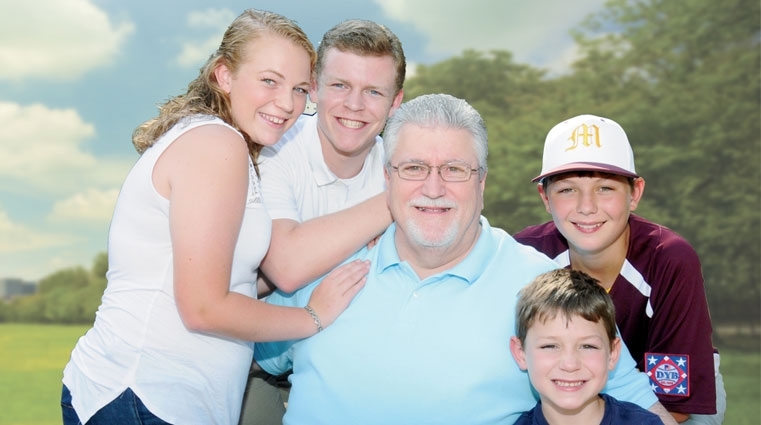 Eventually, Paul developed aortic stenosis, a narrowing of the large blood vessel branching off of the heart. He was informed that the high blood flow in his dialysis fistula contributed to this heart condition. At the end of 2015, Paul underwent heart surgery during which his dialysis access fistula was ligated, or closed off. A venous catheter was placed in his shoulder to provide access for his dialysis treatments. Long-term use of a venous catheter can lead to infection, and the simple inconvenience and lack of comfort was challenging for Paul. “The past-times I enjoyed were realistically no longer things I could do. My health had deteriorated drastically in such a short period of time,” said Paul. During a dialysis session in early 2016, Paul’s nephrologist in Supply, North Carolina, Dr. Sivanthan Balachandran, discussed an option with Paul of having the catheter removed. Dr. Balachandran recommended that Paul see Dr. David Bjerken with McLeod Vascular Associates in Little River, South Carolina. Dr. Bjerken specializes in dialysis access creation and revision. Paul was interested in learning more about Dr. Bjerken and what he could offer. “My research indicated that Dr. Bjerken was highly respected and qualified for my case, so I made an appointment with him,” said Paul. “When Paul came to see me he was in a wheelchair and had a venous catheter in place for his dialysis treatments,” said Dr. Bjerken. “In my career, Paul’s condition was one of the more challenging cases I have treated. There were some lingering effects from his pre-existing fistula. I knew I could find a way to repair his vein, but it would be difficult. I had to be creative in surgically repairing the compromised areas. “Dr. Bjerken is an artist,” said Paul. “I came to him hoping he would be able to offer me a solution for the vein in my right arm. This procedure was tricky, and I knew it was going to take a doctor with the appropriate training to repair the fistula and create a new pathway for my dialysis access. To locate a doctor that specializes in dialysis reconstruction is incredible, especially so close to my home. “The efficiency of McLeod Seacoast also made my experience seamless,” added Paul. “The wonderful, well organized staff was comforting. This area is very fortunate to have this level of expertise available to them.